Whether you’re covering a small retail store or an enormous factory, we bring over 25 years of successful flat roof installations using TPO, EPDM, and APP roofing systems. Mechanical fastening entails placing rows of metal plates fastened to the substrate insulation with screws along the edge of the sheet. The next sheet overlaps the top of the plates and screws and is heat welded to the bottom sheet, forming a seal over the fasteners. This method offers economy as well as structural safety and works well in areas with mild winds. Adhesives applied over the insulation boards hug the entire membrane to the substrate. The overlaps again are melted together with the heat welding machine for structural safety. Entirely glued to the roof, this system holds up well to high winds. TPO offers peace of mind on your flat roof for a reasonable price. To discover how our experts can serve you with a TPO flat roof system, please contact us today. Ethylene propylene diene terpolymer, known as EPDM, is a synthetic rubber membrane that comes in 45, 60 and 90 mil gauges. The elastic composition of EPDM (as opposed to stiffer plastic) withstands the elements that can shorten the lifespan of other materials. Nearly impervious to the sun’s rays, ozone, acid rain and ordinary weathering, EPDM is highly flexible, lightweight and utterly indifferent to freezing temperatures and pooling water. Hail tends to bounce off rather than puncture EPDM. It’s also easily patched and maintained. Very popular precisely for the above mentioned reasons. A fully-adhered, 60 or 90 mil EPDM system is known as the Cadillac of low-slope roof systems and can last over 30 years if properly maintained. Contact us to schedule your estimate for a premium EPDM roof today. This popular flat roof product provides excellent service on well-drained roofs for a much lower capital outlay. Atactic-polypropylene (APP), also known as modified bitumen, is an enhanced asphalt product somewhat similar to roof shingles. It also comes in rolls as a single-ply membrane. Common methods to install APP include torching, to melt the underside, or peel-and-stick self-adherence. If the roof slopes enough to efficiently run water to the drains and prevent pooling, APP can protect your interior for several years with little maintenance. if you are on a budget, you can opt for this. When your budget is tight, APP could be your best commercial flat roof friend. To determine if APP is right for your project, contact us to schedule a free consultation. 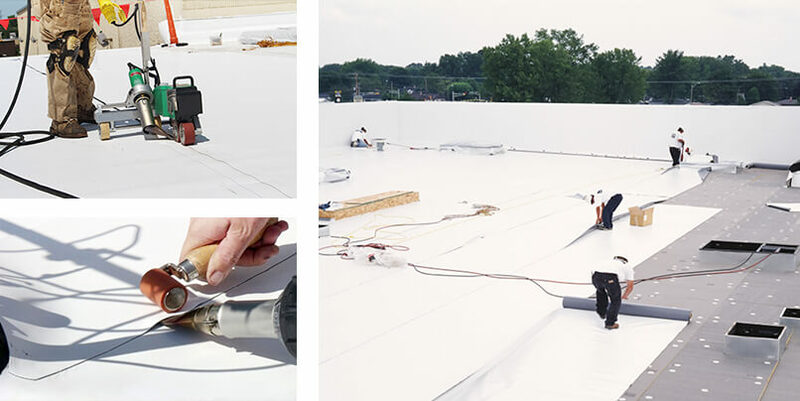 When it comes to installing new flat roofs or replacing old ones, you gain a serious advantage when you hire the best commercial and industrial roofing contractor in London, Ontario, in other words US. With over 25 years of experience installing TPO, EPDM, and APP flat roof systems, you can trust that your project will be done right from beginning to end. We carry all necessary insurance policies and work to the highest standards in the industry. Trust us, you will be delighted with our service as well as the price. Contact us today to schedule an estimate for your commercial or industrial roof.